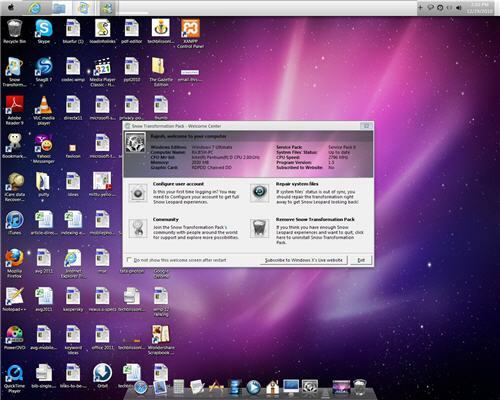 – Transform your windows 7 to Mac OS X Snow leopard and experience the Mac look and feel in windows! This Mac theme for windows 7 works on windows vista too and you can use it on both 32-bit and 64-bit windows OS. Windows 7 has a huge collection of themes designed for it and you can alternate between the free windows 7 themes any day, any time! 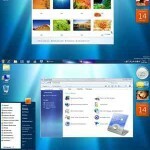 The Snow leopard pack is one such windows 7 theme to transform the entire windows 7 UI (user interface) and it includes the Snow Leopard Welcome Screen, Visual Style, Icons, Wallpapers, Sounds, Dock and much more. How to install Mac Theme for Windows 7? This pack includes the following third party applications. 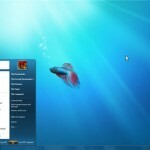 Here is how you can get the Mac look and feel on windows 7. 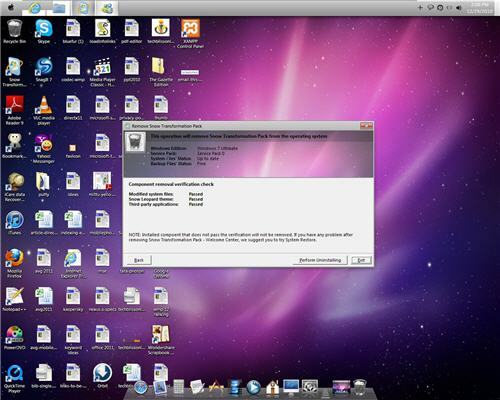 After you download the snow leopard pack, extract the zip to a folder.Then right click and run the snow leopard transformation pack application as an administrator.The pack will require you to disable UAC, to work properly. If you choose “Yes”, it will disable UAC and prompt you to restart the computer. 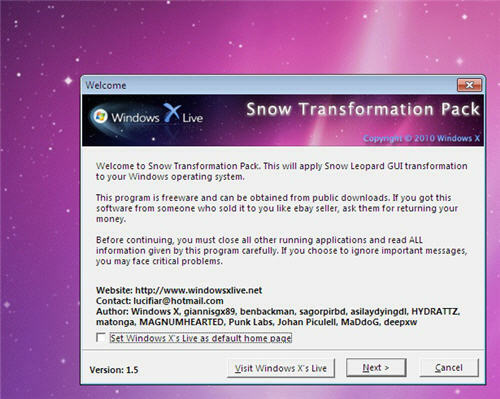 After restarting, double click the snow transformation pack application icon to run it again. You will find the “Welcome” screen as shown below. Click “Next” to continue.You will then be asked to accept the terms and conditions. After reading through them, you can choose to “Accept”. The installation will then continue. If you do find a screen that shows the remaining seconds as 10, don’t be fooled that it will complete soon, as the installation does take considerable time. But it is worth waiting till completion, as it does a pretty decent job of transforming your Windows 7 to Mac! If you do feel like uninstalling the Windows 7 Mac Theme, you can do it any time with a single click. After uninstalling, make sure you enable UAC again. You can enable it by typing “UAC” in “Start” => “Search programs and files”, and then clicking “Change User Account Control Settings”. Then move the slider up, to set it as “Always Notify”. 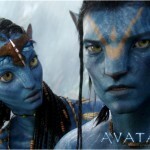 Enjoy the Mac theme for Windows 7 and Vista. It gives a wonderful Mac experience on Windows 7 and Vista and is also easily removable. It is quite big in size (around 30 MB), but the storage that comes with computers these days is quite huge and this size shouldn’t be a problem. The only con is its requirement to disable UAC. Otherwise, it is quite cool.